Oversize diameter and extended length and give positive bolt control for fumble-free cycling of tactical and benchrest rifles. No more holding the bolt handle with two fingers to clear the scope bell. 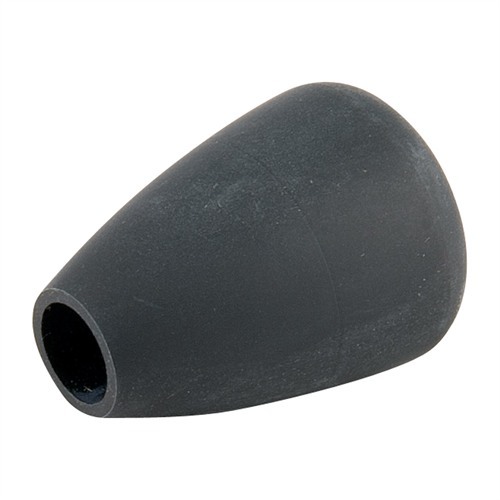 Provides additional leverage needed to clear stuck rounds. Lightweight aluminum keeps weight down. Installation requires machining and threading of original bolt handle. Mini bolt knob includes ½” wrench for scope removal. SPECS: 7075 T6 aluminum alloy, hardcoat anodized, matte black or gloss red finish. 1½" (4cm) long, .975" (24.7mm) diameter. 1.3 oz. (35 g) weight. Mini - Length – 1.21” Diameter – 0.90” Weight – 0.5 oz Gunsmith installation recommended. 5/16-24 TPI. Oversize diameter og utvidet lengde og gi positive bolt kontroll for rote-fritt sykling taktisk og benchrest rifler. Ingen flere holder bolten håndtere med to fingre å fjerne omfang klokken. Gir ekstra utnytter nødvendig å fjerne stakk runder. Lette aluminium holder vekt ned. Installasjonen krever maskinering og threading av opprinnelige bolten håndtaket. Mini bolt ratt inkluderer ½" skiftenøkkel for omfanget av. Spesifikasjoner: 7075 T6 aluminiumslegering, hardcoat eloksert, matt sort eller glanset røde slutte. 1½"(4cm) lang,. 975" (24,7 mm) diameter. 1,3 oz. (35 g) vekt. Mini- Lengde-1.21" Diameter-0,90" vekt-0,5 oz børsemaker installasjon anbefales. 5/16-24 TPI. Great product, fitted onto my Rem 700 in .204 to help with clearance from scope when cycling action. Had previously had a look at full sized knobs but they didn't fit with the look and function I was chasing. If you are half capable, the job can be done at home with a hacksaw, file and die of the correct thread size. I will be purchasing a couple more for both my long range rig and target rifle, which has a particularly stiff bolt after firing. This is a must for anyone. Not only tactical shooters. This knob allows you to remove stuck cases better, faster cycling on the bolt and an overall easier grip. 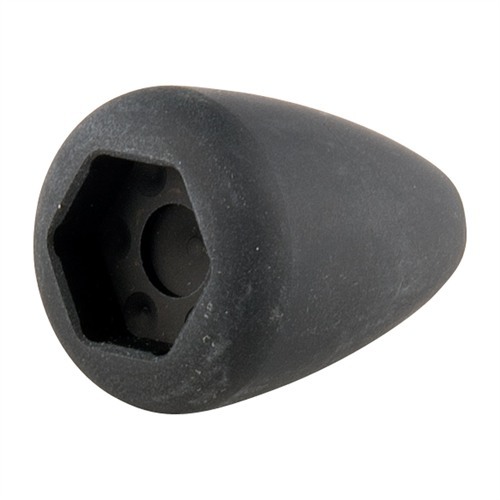 i was looking for something to replace the standard bolt knob on my remington 700P and had seen several rifles with this knob on them, and decided i wanted something similar. after looking at what all was available i decided on this one because of the size dimensions and shape. i ordered through brownells and got a fantastic price and they were the only place that had them in stock. kudos to brownells on that. after getting my bolt back from AZ Precision, and taking it to the range, i have to say this bolt makes a HUGE difference. working the bolt is easier as the knob is far easier to get a hold of and fits my hand a lot better, the length of the bolt handle is extended by over an inch giving you better leverage, and since the knob is aluminum it doesnt at any weight! 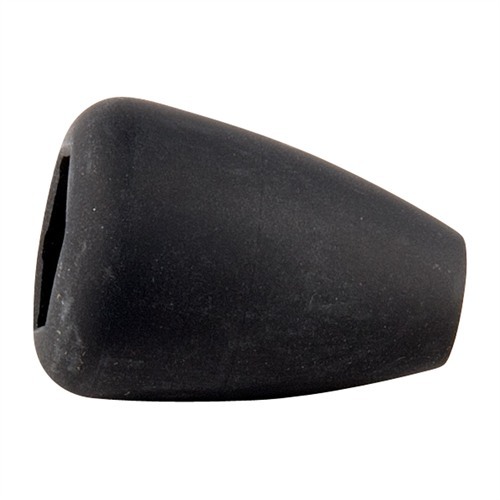 it is PERFECT for the serious shooter looking for a way to improve the function of their rifle. it makes rapid bolt manipulation so much easier you wont beleive it until you feel it for yourself. This is a very affordable and very great upgrade, and this particular part, from this seller at this price is just fantastic. cannot be beat! I have recommended this to three other friends who have long rifles and all will be purchasing and having this installed based on how well it works on mine. Put it on 2 of my rifles exellent quality and also very good looking but the most important thing is it holds very well against the elements. pleased with the looks,feel and ease of use. I recently installed this product on my sniper rifle and could not be happier with the outcome. I installed the knob myself using a combination of a dremel tool with a reinforced cutting wheel, bench grinder and hand files. It took me slightly less than an hour and a half to complete the alteration to the bolt handle. Definitely not for the inexperienced to install. This is a great addition to the Remington weapon system. I installed this bolt knob on a customer's M77 SS bolt handle. The cast SS Ruger bolt handle was tough to machine and thread but the final result was spectacular. These knobs were designed for the Remington 700 but I have used them successfully on many different makes of rifle bolts. I would recommend this product be installed by a qualified machinist or gunsmith to achieve the best results. Produsentnr. : 30674 Oversize diameter og utvidet lengde og gi positive bolt kontroll for rote-fritt sykling taktisk og benchrest rifler. Ingen flere holder bolten håndtere med to fingre å fjerne omfang klokken. Gir ekstra utnytter nødvendig å fjerne stakk runder. Lette aluminium holder vekt ned. Installasjonen krever maskinering og threading av opprinnelige bolten håndtaket. Mini bolt ratt inkluderer ½" skiftenøkkel for omfanget av. Produsentnr. : 30631 Oversize diameter og utvidet lengde og gi positive bolt kontroll for rote-fritt sykling taktisk og benchrest rifler. Ingen flere holder bolten håndtere med to fingre å fjerne omfang klokken. Gir ekstra utnytter nødvendig å fjerne stakk runder. Lette aluminium holder vekt ned. Installasjonen krever maskinering og threading av opprinnelige bolten håndtaket. Mini bolt ratt inkluderer ½" skiftenøkkel for omfanget av. Steel Picatinny Rail Blank 7.75"